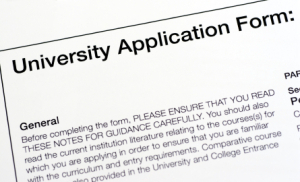 Home › FAQ › When Should You Start Applying to College? Your high school years are a time to begin wondering about when to start applying to college. It’s an exciting time as you think through school and career choices. Although it’s never too early to think ahead, your junior and senior years are of particular importance as you plan toward your college years. College applications can be a rigorous process. To do them well, you need to have ample time to write essays and answer questions. Since different colleges have different deadlines, you will also need to keep track of those deadlines if you are applying to several schools. Most colleges have deadlines in the first half of your senior year, if you are applying for enrollment during the fall of the following year. According to Petersons, that means you will probably do the bulk of the actual applications during the fall months of your senior year, finishing them up before your winter break. Many students start working on their applications in the summer before their senior year. Even if you don’t start writing then, it might be a good idea to track the deadlines of your college applications during that time so that you can pace yourself when you do start writing in the fall. You could also begin to write some practice essays in the summer. The question of when to start applying to college will likely be on your mind much earlier than that, however. Before you can begin to fill out those applications, there are plenty of other things you can do to prepare for the process. One of the most important is to choose the schools that you plan to apply to. That part of the process is something you will likely do during your junior year. It’s helpful to decide early enough on so that you can actually visit the campuses of the colleges on your list. Eleventh grade is an important year in all kinds of ways. You can use the time to visit college fairs, talk with students at the colleges in which you’re interested, and prepare for your SATs by taking the PSAT. Some of your very best resources in the college planning process are people. Talk with your parents, teachers and guidance counselor as you look ahead and make your plans. They can not only help you prepare for the actual steps of the application process, they can help you think through your particular strengths and skills. That’s important as you decide what colleges might have the right programs of study for what you want to pursue. It’s also important as you think through what you want to say and how you want to present your particular skills and interests on your application essays and in interviews, according to US News and World Report. Preparing and planning for college is an exciting time, but it can also sometimes feel stressful. Beat the stress by utilizing your resources well and planning enough ahead that you feel confident and unrushed when it’s time to actually make your applications. When you put those things in place for yourself, the question of when to start applying for college hopefully won’t feel too daunting.